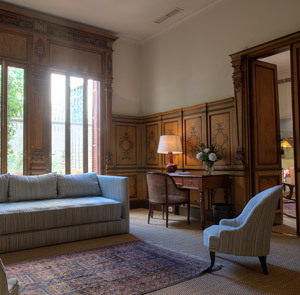 Strip away the contemporary art and the Egyptian cotton linens, the screens on the walls and the terrycloth robes in the big modern bathrooms, and it’s easy to imagine the original, regal appeal of this traditional Mallorcan mansion. 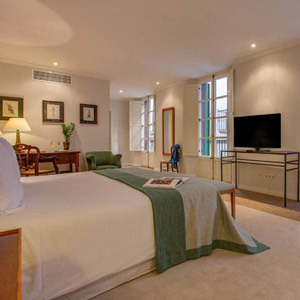 Arriving at Can Cera, passing under its old stone archway and into its leafy central courtyard, you enter a particularly inviting oasis within the already elegant Mediterranean enclave of Palma de Mallorca’s old walled city. A little farther on, up a marble stairway, waits a series of comfy salons, all full of cushiony nooks that invite a respite before continuing to one of the twelve guest rooms. 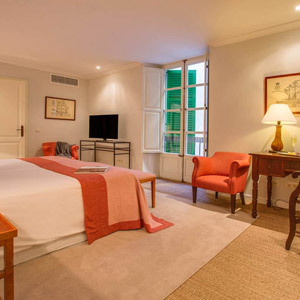 The effect, as you travel from the street to the courtyard to the public spaces to the bedroom, is one of sliding into ever-deeper states of leisure — or, to put it another way, of living like an old-fashioned aristocrat. Of course the old-fashioned aristocrats didn’t have a spa with a hammam and a Finnish sauna, nor a modern gastro-bar serving seasonal Mallorcan-style tapas. These are later additions, the results of a 2012 renovation, just as all those salons were added on when the eight-hundred-year-old building got its previous major upgrade, in the 17th century. Suffice to say the owners of Can Cera don’t go ripping up the floors every time there’s a new, fleeting trend in Balearic hospitality. The design choices are well considered, and the restraint shows — cream-colored walls, olive wood furniture, warm lamplight and big sunny windows. For centuries Palma de Mallorca’s old quarter was the neighborhood of choice in the Balaeric Islands, home to the royals, the aristocrats, the powerful clergy and all their respective trappings. After a period of neglect, the picturesque public squares and impressive Gothic churches have been restored to their former glory, and they’re increasingly surrounded by high-end designer retailers, new art galleries, upscale bars and an eclectic mix of restaurants. Situated in the heart of the old walled city, Can Cera is well-positioned for exploring it all, the historic city and all its new arrivals. No doubt the villas in the hills, the resorts on those far-flung beaches, the thumping sirenic sounds of Ibiza will all still be there for years to come — but if the enduring appeal of a place like Can Cera is any indication, one has to think that Palma de Mallorca’s old city is here to stay, more than a passing stopover on the way to somewhere else. Can Cera Hotel is located 12 minutes away, by car, from Palma Mallorca Airport. Please contact CustomerService@TabletHotels.com for more information or assistance with transfers. Vistas: patio, ciudad o sin vista.